Happy birthday Zilpha Keatley Snyder (The Egypt Game), Francine Jacobs (Sam, the Sea Cow), Juanita Havill (Jamaica’s Find), Peter Sìs (Tibet Through the Red Box), and Jane Sutton (Don’t Call Me Sidney). It’s the birth date of Sheila Burnford (1918-1984), The Incredible Journey. Painter Salvador Dalí (1904-1989) was also born on this day. Read The Mad, Mad, Mad World of Salvador Dali by Angela Wenzel. Happy birthday Minnesota, the 32nd state as of 1858. Read V is for Viking: A Minnesota Alphabet by Kathy-jo Wargin, illustrated by Karen Latham and Rebecca Latham. It’s National School Nurse Day. Read Cherry Ames: Boarding School Nurse by Helen Wells. Last week was Children’s Book Week, when kids around the country celebrated the books they love to read. I’d like to continue the conversation this week with a topic always on my mind. How does an author create a book that will really make a difference in the life of a child, one that will open up a vision of the world that has escaped that child until he or she picks up that volume? Books for children can do many worthy things – inspire, entertain, foster a desire to read more. But some rare books actually have the power to change the way a child looks at the world. 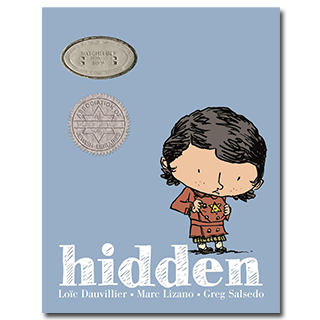 Our book of the day, Hidden by Loie Dauvillier, a graphic novel first published in France, focuses on the French resistance during World War II, particularly the plight of one Jewish family and one Jewish girl. At first Douina must wear the Star of David and be singled out for punishment and humiliation. Eventually, to save her life, kind neighbors, part of the French resistance, take Douina in and shelter her, facing devastating consequences for their act. Later Douina finds herself removed to a farm in the country, where she takes care of chores and lives the most normal life she has experienced since the Nazis invaded France. Because the book has been framed by a grandmother relating the stories of her childhood to a beloved grandchild, the arc of the story has been given some gentleness and kindness that might otherwise not be there. And an afterword about the events in the story states that 84% of the French Jewish children were saved by people unwilling to accept racism and hatred. Illustrators Marc Lizano and Greg Salsedo take an extremely compelling text and have made it human and believable. Douina’s struggles, emotions, and trauma all become tangible in the art. In the end, when Douina is reunited with her mother, the picture of this concentration camp survival shocks readers, bringing the full horror of the war to a single image. When I was in fifth grade, I remember the place, day and hour that I opened a group of Life Magazines and saw for the first time photographic evidence of the Holocaust. It was in my own life a moment when my vision shifted completely. I believe graphic novels like Hidden have the same potential to alter the way children look at the events of the 1940s. They put a face on the suffering, bringing an intimacy that art allows. 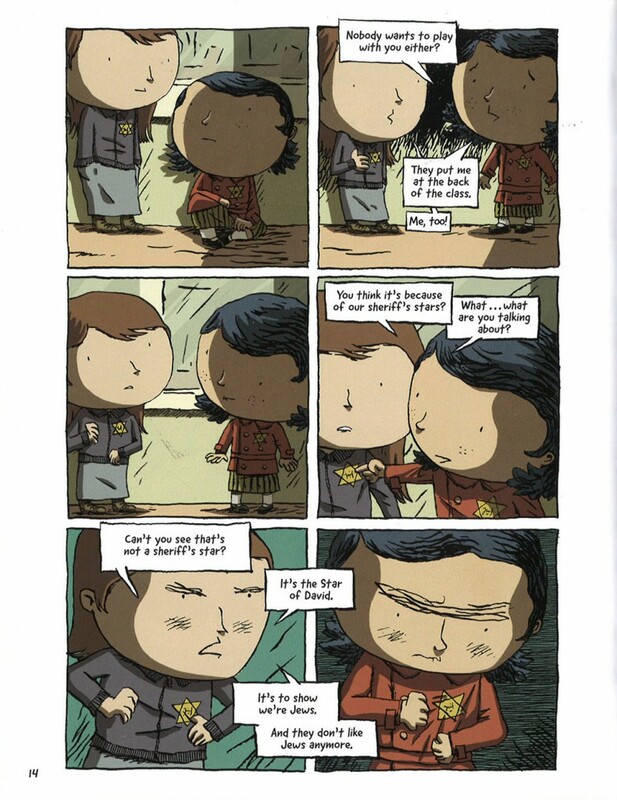 And so I hope you find some time to bring to the children in your life books that will affect the way they look at the world—powerful graphic novels like Hidden. Originally posted May 11, 2015. Updated for . I love your line about graphic novels: “They put a face on the suffering, bringing an intimacy that art allows.” My 8th grade students are deeply interested in the events of the Holocaust, and this graphic novel is an important part of our collection. Thank you so much for highlighting it. I snapped to fully alert awareness when I read that statement. She has sent a river of light through the very core of my soul, with that piece of writing. If I had the books that this good lady loves, in my early days, the despair would have met a profound neutralizer. Children’s books, for countless children are, and could be the real guardian angel needed by millions of them across the globe. My personal aim is to be a part of that. The foundation for my vision was put in place by the author of this web site. I’m out to find this one. Anita, I, too, am haunted by your thoughts in the first paragraph. Thank you, and thanks for bringing this book to our attention. Thanks Leda, Gordon and Anne for your comments. I would love to hear at any time from my readers about books that have changed their lives. Note: My library lists the author’s first name as Loic (not as Loie). Thanks for the review. I will share this title with my grandchildren.